Getting your qualification is just the start of the safety professional’s journey towards effective workplace practice. World Class Health and Safety doesn’t repeat the whys and what’s of health and safety management, instead it is a helpful how-to guide for newly qualified and experienced health and safety professionals to get the best out of their knowledge, experience and the people they work with. This book is filled with practical examples that bring the subject to life, covering the skills and techniques you need to be a leader of safety, overcome inaction and make lasting positive changes to safety performance and culture – enabling more people to go home safe every day. World Class Health and Safety teaches the reader to work efficiently and effectively with senior managers and budget holders to implement the wider corporate social responsibility agenda, emphasize the ‘value-added’ benefits of good health and safety management clearly and simply, create effective and engaging training and use monitoring and audits to get the best out of the resources available. 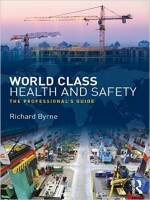 World Class Health and Safety is essential reading for those wishing to invest in their own professional development, to communicate effectively and to understand and deliver safety in the wider business context, wherever in the world they might be working.